For those of us who have lived (and worked) through the early days of the World Wide Web, we will have some fond – and not so fond – memories about early websites and early applications. Many of our favourites are dearly departed. Netscape Navigator is long gone as a browser. Geocities is no longer around to make horrible websites about our pets with. And as much as I really wanted them to take off (not really) we are not using Beenz as virtual currency. However, you will be surprised what early innovators are still going. I won’t say going strong, but they are still going. The very name itself fills me with dread. By the late 90’s we were already at a point where MP3 was a viable option for playing sound bites on a website, yet RealPlayer was still a thing we had to download to listen to those awful quality .RA files with. Each version of the app (RealPlayer, ReaplPlayer G2, RealOne) got more bloated and the sound quality didn’t improve. The software was so awful, if we were stuck in a position where an .RA stream was all that was available, the savvy amongst us went off and installed the third-party Real Alternative codec. Would you believe this thing still exists? As of only last month did RealNetworks Inc. actually replace the RealPlayer with a new app, called RealTimes. Apparently its function is to make multimedia montages from photographs and videos and it all lives in the cloud. Sounds amazing. Before Skype, before MSN Messenger, there was ICQ. This is how the cool kids chatted to each other when we got home from school. Who doesn’t fondly remember the ‘ching ch-ch-ching ching ching’ of the typrewriter sound as you two-finger typed your LOLs and ROFLMAOs to your best friend. When they replied, ICQ would bleep you with an ‘Uh-oh!’. For its time, it was a great app. We may have all moved on to Skype (and realistically, Facebook) but ICQ is still kicking along. The app has been refreshed many times and there is still an actual ICQ network. Apparently you can still log in with a UIN (that’s Universal Identification Number to you n00bs) but as I’ve forgotten my password – and the email account attached to that account is long, long gone – I can’t login. It’s a shame as I was such an early adopter (1996) that my UIN was only six digits long. Feel free to send me a message – my UIN is 703889 – but I won’t be able to receive it. Ever. The least surprising still-alive-technology for me personally is IRC, or, Internet Relay Chat. IRC is a real-time chatboard where users, anonymously, talk crap to their friends about anything and everything, and trade vast quantities of illicit software. mIRC was the default choice for all users for accessing the various IRC networks and apparently still is. Under active development for twenty years, mIRC (often pronounced phonetically) boasts 51,000 likes on Facebook and has been downloaded over 40 million times so clearly there are still people using the IRC networks – I wonder who they are? 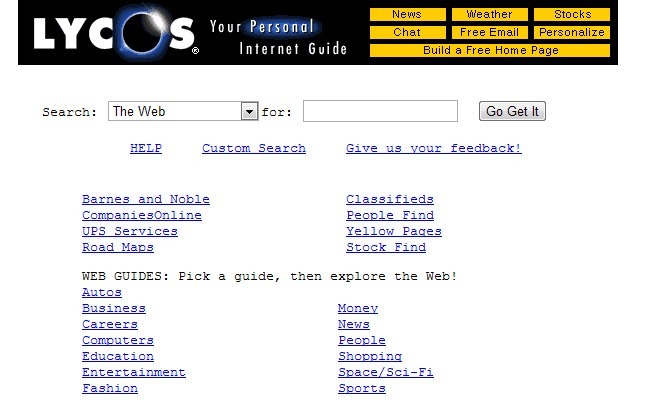 It was a sad day when Geocities died. All those gloriously bad websites created using their page builder vanished overnight. No more broken images, no more side-scrolling marquee text and blinking headings in bright green announcing WELCOME TO MY HOMPAGE. And sadly, no more guestbooks! But the age of the free website isn’t over. Although not as popular as Geocities, Angelfire held its own. All your favourite old Angelfire sites are still kicking along, in their HTML Table designed glory. The best part? 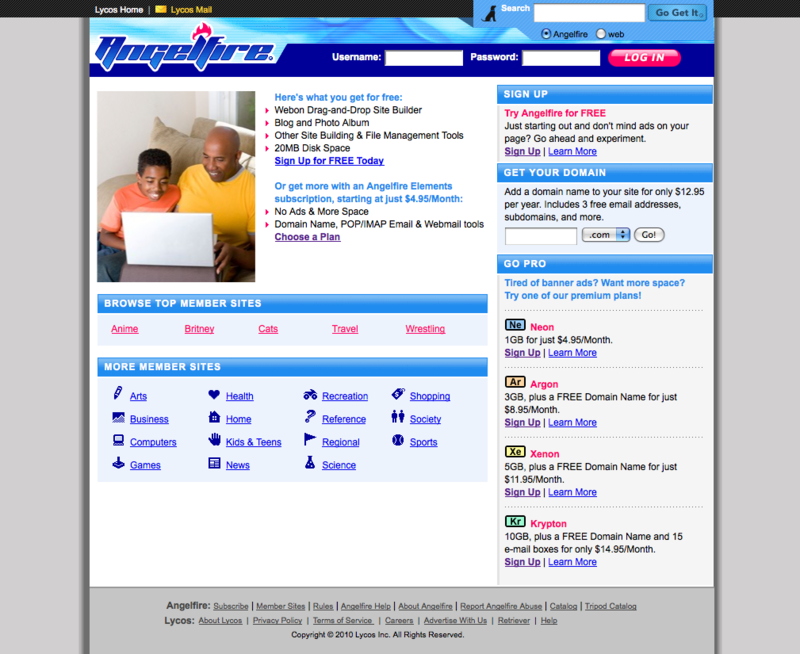 You can still create new Angelfire free sites. If you look in the footer you will see who is responsible for keeping the lights on at Angelfire, which co-incidentaly brings us to the next internet thing you won’t believe still exists. Back in the dark ages before Google, we still had search engines. To my recollection the field was dominated by AltaVista, Yahoo and Lycos. Yahoo of course is still a popular brand – perhaps not so much in Australia, but the Japanese love it. AltaVista went the way of the dodo in 2011. Lycos however keep trucking along. The current version offers mail, news, games, online TV channels and of course a search engine. I have no idea if their index is self-powered or if they sponge off another leading searching engine but one thing for sure is, Lycos is not a relevant part of the Australian Internet. View Previous blog Is cart abandonment killing your business?